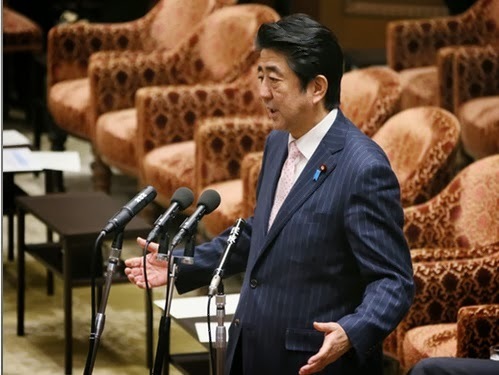 Shisaku: What Gives Abe Shinzo The Right To Re-Interpret The Constitution? What Gives Abe Shinzo The Right To Re-Interpret The Constitution? Prime Minister Abe Shinzo anxwering questions in Diet Budget Committee session on 20 Febraury 2014. Original image courtesy The Prime Minister's Residence website. During the foreign policy and security interpellations in the House Budget Committee session last week Liberal Democratic Party member Iwaya Takeshi asked, amid his questions to the Prime Minister, the Minister of Defense and other government officials, for the Cabinet Legislation Bureau's opinion on who has the right to interpret the Constitution. Since Richard Samuels has written What Everybody Needs To know About The Cabinet Legislation Bureau (not the actual title) I will eschew further explanation of the significance of Iwaya asking for the CLB's view. Deputy CLB Director Yokobatake Yusuke, who was filling in for CLB Director General Komatsu Ichiro during Komatsu's hospitalization, responded that three articles of the Constitution are paramount in determing who can interpret the Constitution. The Supreme Court is the court of last resort with power to determine the constitutionality of any law, order, regulation or official act. "The Emperor or the Regent as well as Ministers of State, members of the Diet, judges, and all other public officials have the obligation to respect and uphold this Constitution." Reinterpretation might be a way of showing respect for the Constitution, maybe. Finally, Yokobatake concluded, there is Article Argle-Bargle, which establishes that the prime minister, via the Cabinet, has ultimate responsibility. Now one needs to know that I have tinnitus. My life is a constant series of cuppings of my hand to my ear and saying, "Eh?" In this case, my saying "Eh?" to the live video broadcast from the Budget Committee chamber did not provoke Yokobatake to return to the microphone and repeat himself. When I cannot importune the speaker to repeat himself or herself, I have to guess what it was that he or she must have said. Being less than an expert in the Japanese Constitution but generally knowing my way around, I had to reason out which article would be granting the PM power to interpret the Constitution. Because that which sounds like "Article Argle-Bargle" and the articles in that neighborhood have nothing to do with that right. "The Diet shall be the highest organ of state power, and shall be the sole law-making organ of the State." I plunked out a series of messages saying that the CLB had spoken and by its ordering, had put the Supreme Court on the front lines of constitutional interpretation, with the Diet, the Cabinet and the PM coming after. It was not until the next day that I could review the archived video on the House of Representatives TV website. To my surprise and not inconsiderable delight I found out that my ears had not failed me. Deputy CLB Director Yokobatake had indeed said, "Article Argle-Bargle." More precisely he said that the Cabinet's and the Prime Minister's power to interpret the Constitution came from "Article Ninety-Five" (Kyuju go jo). Article 95: A special law, applicable only to one local public entity, cannot be enacted by the Diet without the consent of the majority of the voters of the local public entity concerned, obtained in accordance with law. Reading the above, one can understand my original reaction of thinking that I had not heard Yokobatake correctly. He was reading the article number upside down. If one flips the first digit of the Arabic numeral notation for Ninety-Five -- 95 -- one gets 65 (rokuju go jo). Article 65 - Executive power shall be vested in the Cabinet. Now one can pat oneself on the back and say, "Isn't that grand. The highest ranking active official in the bureau of the government known as 'The Guardian of The Constitution' (Kenpo no bannin) cites a completely irrelevant article of the Constitution in Budget Committee session before full house of national specialists in the law including the prime minister, Representatives, high ranking bureaucrats and legal experts, and no one flinches or even gets a confused look on his or her face." Great, fine, but that is not the interesting part of Yokobatake's error. Yokobatake did not, as I assumed he must, cite Article 41 (I will use the usual format from now on). When one compares the two articles, 41 and 65, "the highest organ of state power" and "sole law-making organ of the state" sure sound more like ultimate authority than simple "executive power." Reviewing what Abe Shinzo has said regarding his plans to reinterpret the Constitution (which has been the subject of intense and bombastic debate in the newspapers, on blogs and on Twitter), he never says that he has the authority to do so. He declares instead that he has the ultimate responsibility for the Constitution -- which seems to be a different issue. In terms of the nitty-gritty, when in the process of reinterpreting the Constitution does Abe has to let the Diet ("the highest organ of state power") debate the proposed reinterpretations? Can the Cabinet can issue a Cabinet Decision (kakugi kettei) approving the interpretatiion allowing for collective security before the passage of the new laws enabling the new interpretations? By citing Article 65 and not citing Article 41, the CLB seems to be taking the rather provocative position that the Cabinet can by itself declare the new interpretations government policy, with the Diet brought in ex post facto. If the Abe Cabinet tries this approach with collective security legistlation, the resulting firestorm could make last autumn's fight over the Special Designated Secrets Act seem like a match flame in comparison. Which begs the question: did Yokobatake, the constitutional expert, cite an irrelevant but visually related part of the Constitution on purpose? To play devil's advocate, here's another shot: Look first at Article 98, para. 1, which says "This Constitution is the *supreme law of the nation* and no law, ordinance, imperial rescript or other act of government, or part thereof, contrary to the provisions hereof, shall have legal force or validity." This says that the Constitution is a law. And Art. 41 says "The Diet shall be the highest organ of state power, and shall be the sole law-making organ of the State." So who can stop the Diet from amending *the law* that is the Constitution? As for Art. 65, well, in theory executive power is distinct from law-making power. But in practice, the Ministries make laws all the time, in the form of regulations. Ergo, no problem for the Cabinet, since delegations of law-making power to it have been a custom or constitutional convention (as the Brits call it) for pretty much the whole history of the Kempou. This is, of course, total nonsense. Start with Art. 1: "The Emperor shall be the symbol of the State and of the unity of the people, deriving his position *from the will of the people [日本国民] with whom resides sovereign power*." Then consider the amendment procedures in Art. 96, which provide that amendments to the Constitution must be approved by the people. This context shows that even if the Diet is the highest law-making organ in the State, there is an authority *higher* than the State -- the Japanese people. And that authority can't be avoided by an end run. There simply isn't any way to make a sow's ear from this silk purse. Unless of course, there is: as the Supreme Court ruling on the December 2012 election made clear, basically the Constitution plays the same role in Japan as a friend of mine once said years ago about traffic signals in Taiwan: at most, it's there for consultation only. Thank you for your long comment. If I may, I believe the issue is interpretation, not amendment. The existence of an article outlining an amendment procedure indicates the right to amend has never been in question. If the Cabinet Legislation Bureau ceases to function as a non-partisan arbiter on constitutionality, ceding that role to the Supreme Court, what would be the standing for persons withing to be plaintiffs in cases filed on security issues? Thanks for your reply. My construction was tongue-in-cheek. It posited an argument based on Art. 41 as the source of power to reinterpret, that the Constitution was simply a "law" within the Diet's purview. In that context, I mentioned Art. 96 as cold water on this notion. But since the argument was facetious, it's not worth parsing further, other than to say maybe it was a too-complicated joke that flopped, esp. when it became serious. But there could be a serious justification for the CLB. It's very common for certain practices to acquire something like constitutional status even though they're not written into a country's constitution. This is the idea of constitutional convention (in the sense of custom, not constituent assembly) that I mentioned earlier. In the US, strong judicial review is an example. So is the custom that the Speaker of the House is both a member of the House of Representatives and leader of the majority party: under the Constitution as written, the Speaker doesn't even have to be a member of Congress. In Japan, we have the example of weak judicial review (that a law can be unconstitutional, but government actions pursuant to it are allowed to remain in effect) -- though unlike the others it arguably goes against the written constitution, instead of merely supplementing the text. One might argue that the CLB's interpretational role has by now become a constitutional convention, making it unnecessary to find a textual justification. I'm not sure how good this argument is -- e.g., if a non-LDP government disbanded the CLB, that would weaken the claim of custom. Constitutional conventions evanesce once they're broken. But if I'm not mistaken, I think the DPJ governments merely tried to ignore it. There are other ostensible democracies where the executive interprets the constitution -- though Japan's practice isn't exactly analogous. Samuels mentions the French Conseil d'État as the historical role model for the CLB's predecessor. But that organ is mentioned in both of the post-war French constitutions (in passing in the IVth Republic version, originally enacted in 1946, and extensively in the current Vth Republic version, originally enacted in 1958), whereas the CLB is absent from Japan's. The US Office of White House Counsel interprets treaties, e.g. about what constitutes torture, and routinely advises the President whether he has the constitutional power to do something. The Executive Branch often acts on this advice, as presumably Japan's executive will act on the CLB's. But OWHC interpretations aren't binding on Congress or the Supreme Court. Unfortunately, Japan's Supreme Court apparently has a custom of not intervening in matters where the CLB has spoken. My question is more procedural. For the Supreme Court to become involved, there has to be a lawsuit. On what grounds could a citizen file suit against the government over national security principles? I don't know the answer to that question. You're right that Japanese courts don't issue advisory opinions. I'll guess that one possibility might be a suit by a member, or family of a member, of the Self-Defense Forces who suffers injury or death during a mission that would not have been authorized under the earlier constitutional interpretation. But I imagine there would be a lot of pressure exerted to prevent such a suit from being brought. And if it did get up to the Supreme Court, I think it's highly likely that the court would neither endorse nor reverse a CLB reinterpretation of Art. 9. In the wrongful injury/death scenario, the cleanest way would be for them to find some way to disallow a suit by a Jieitai member or his family; it could be that there's already some precedent on that. More generally, they could invoke the political question doctrine, as they've so often done. That could mean that they simply refuse to consider the constitutional question at all because it's too intensely political. Or it could mean that they cast doubt on the interpretation's validity, but ask for one of the political branches to take appropriate action, on the model of the election law cases. There might be a slim chance they would uphold the interpretation, either while rhetorically slapping the wrist of the CLB, or giving that board a thumb's-up. But I think the Court would regard this as setting an undesirable precedent for their venturing into political issues, so it's probably not a serious option. Regardless of whether there are other grounds for a citizen suit than the one I proposed, I think this political question calculus will come into play. I don't think the Court will want to confront the issue at all.